“The boardroom?” Forget it. Think, Tony Stark, MI6, and Transformers. The Internet of Things, consumer electronics, big data, dynamic content, the cloud, security, and high real-estate costs are reshaping the boardroom. For four days a year these rooms must deliver the highest quality, efficient, and collaborative experience available. But the need to see an ROI, and common sense have opened these rooms to mission critical, collaborative meetings throughout the year. The following categories represent transformative technologies and solutions that are must-haves in today’s multi-function boardroom with highest expectations. Having the ability to display multiple streams of content in multiple “windows,” simultaneously is driving the trend toward video walls. Many manufactures offer hardware and software presentation solutions to support collaborative visualization. Barco's OverView Seamless Videowall (OSV) series is a range of seamless, solid-state rear-projection displays that can visualize a mix of data and video in high quality without the distraction of seams or bezels. The OSV comes with TransForm C, a controller and collaboration management system that enables all content to be positioned optimally on the screen by means graphical user interface with touchscreen. CineMassive offers a complete collaborative visualization system. The ultra-HD video walls and processors enable video, PDFs, images, and other presentation content to be easily routed to the video wall from any source in the room. Integrated, two-way video and audio conferencing enables communication and content sharing between multiple locations. LG’s largest commercial-grade direct-view monitor, the LG 98LS95, 98-inch (8-foot+ diagonal) edge-lit LED display, is in itself a video wall. The 16:9 aspect ratio and 3840 x 2160 resolution, displays images with superior brightness and detail and four times the resolution of Full HD (1080p) displays. It has a bezel width of just 14.6mm, and can be mounted in a portrait or landscape mode. LG’s webOS for Signage platform provides an all-in-one hardware and software solution. Photo copyright @The Sextant Group Literally and figuratively, display manufactures saw the writing on the wall, with functionality far beyond its predecessors of even a couple of years ago. Brady O. Bruce, chief marketing officer at InFocus noted, “InFocus believes that systems-level solutions specifically designed to improve communication, improve collaboration, while eliminating the need to travel is what companies will need moving forward.” Integrated solutions featuring video conferencing and information sharing in an all-in-one solution are the products that are going to help teams collaborate, save money and increase business. “We’d like to see a workplace of the future where companies embrace collaboration and give their employees the tools needed to do it successfully and easily across the boardroom, the office, or the globe." InFocus’ Mondopad 2.0 blends video calling, whiteboarding and more into one giant touchscreen PC for efficient face-to-face collaboration with people in any location. Available in three sizes (57-, 70-, and 80-inch diagonal), the large-format, all-in-one, video conferencing touchscreen collaboration device is designed for the conference room, and multi-point office. New features make sharing, annotating, archiving and overall collaboration easier, particularly between multiple locations. Planar UltraRes Touch combines a 75-, 84- or 98-inch, 32 point multi-touch experience with stunning 4K image clarity. It offers a best-in-class solution for collaboration and annotation using a large viewing area, and enterprise-level features. The displays operate without fans, providing whisper quiet operation and reduced points of failure. Prysm Enterprise is a combined hardware and Software-as-a-Service (SaaS) solution which enables businesses and their employees to easily collaborate in real time across every size screen—from mobile devices to custom large-scale video walls. The Enterprise unique offering includes cloud application servers and workspaces, displays with five standard sizes from 65- to 190-inches, as well as custom sizes, web browser for mobile devices. Photo copyright @The Sextant Group A few years ago, some were predicting the end of projectors in the boardroom. That was before lamp-less laser projector technologies advanced to offer brighter images, very low maintenance, and long-life. The laser projector has secured its position in the executive boardroom. Digital Projection’s E-Vision Laser 8500 projector was featured at the Digital Projection booth at ISE 2016, in portrait mode using ultra short-throw lenses. The projector delivers a stunning 8,500 lumens from a stable solid-state light source, capable of producing over 20,000 hours of illumination. This single chip projector was developed with Fit and Forget’ directive, ensuring it needs only minimal maintenance throughout the lifetime of the display. This key characteristic allows the E-Vision Laser to have a much lower cost of ownership over the lifespan of the display. Sony’s Ultra short throw SXRD 4K projector, 2,000 lumen with blue laser phosphor technology is a unique entry to the boardroom. The throw varies from seven inches down to almost zero, measured from the screen to the edge of the cabinet. You can place this projector next to the wall and get up close without blocking the light cone or casting unwanted shadows. Picture size varies from 66 to 147 inches diagonal (in 17:9 format, achieved at 0 and 7 inches throw, respectively). Sony has also announced the broadening of its line of laser light source (Z-Phosphor) projectors in the mid-brightness range with three new models between 4,100 and 6,000 lumens. The new models are the VPL-FWZ65 (6,000lm WXGA); VPL-FWZ60 (5,000lm WXGA); and the VPL-FHZ57 (4,100lm WUXGA). Panasonic’s PT-RZ670, 1-chip DLP, laser projector with 6,500 lumen of brightness. Frame-by-frame scene-linking modulation with complete digital control makes it possible to adjust the light output with higher precision, delivering a 10,000:1 contrast without lowering the brightness in bright scenes. This enables highly precise contrast control even when bright and dark scenes suddenly or frequently interchange. Boardrooms today have multiple display options including video walls, projectors, and secondary displays. A robust video wall processor enables the display of multiple sources across the displays. AMX by HARMAN’s SVSi N-Series windowing processors are capable of handling multiple real-time IP video streams with no video input or output connectors – only network ports. The N3510 accepts up to nine H.264 streams from most sources while outputting the windowed HD video stream from local viewing through its HDMI port or in streaming format to a remote hardware or software decoder. Each input can be cropped, scaled, and positioned according to stored presets (such as quad, window-in-window, 3+1, etc) or in any user-defined configuration. Black Box’s VideoPlex4 4K Video Wall Controller is a standalone display wall controller/scaler that outputs high-resolution DVI video, up to 4K, to multiple monitors. Features include: program output configuration via USB connection to a PC, and easy control of cropping, scaling, rotation, and gaps. Crestron’s DVPHD High-Definition Digital Video Processor multi-window video processor displays high-res computer and high-definition video signals with HDCP, provides a fully-customizable HD graphical environment, and enables real-time annotation and touch screen control in a modular, scalable hardware platform. Matrox’s Mura MPX Series video wall solutions come in many forms. Leverage your system’s existing GPU with one or more Graphics eXpansion Modules (GXMs) external multi-display adapters to drive dynamic 2D and 3D content on up to six monitors; Achieve support for up to 16 monitors from a single PC by combining multi-display graphics cards featuring multi-board support; or Capture full-HD content in real time to fill as many as 56 displays, using Muravideo display wall controller boards. RGB Spectrum’s MediaWall V Model 550 display processor supports wall arrays of up to 24 HD/2K displays, and up to 12 UHD/4K displays. Display processors include a dedicated Application Processor (AP) option capable of decoding up to four 1080p/30fps or twenty-four 640x480p/30fps IP streams. It functions separately from the wall processing engine, ensuring that applications and video wall operations each receive dedicated resources. Rose’s QuadraVista HDMI is a flexible and powerful multi viewer product with the capability to control and monitor up to four HDMI video sources on a single display. The unit provides simultaneous support for HDMI and DVI video with high quality resolutions up to 1920 x 1200. Features include automatic sensing of the input signal, picture-in-picture, video loss detection, and automatic output monitor resolution detection. Each of the four individual displays is highly customizable, and can be resized, repositioned, swapped, or locked to the present window layout. tvONE’s C3-540 CORIOmaster enables windows to be sized to fit the wall or multiple windows added, resized and rotated 360 degrees on the video wall independent of the output rotation. There are 36 maximum system windows that can be used on up to 4 video walls. Each video wall can have a maximum of 14 windows depending on the source resolution, frame rate and size of window. Ultimately, microphone selection is a balance between room design and function. Boardroom aesthetics are also important. AKG’s PCC170 and the PCC170 SW are professional boundary layer microphones with supercardioid polar pattern to minimize background noise and feedback. The microphones are designed for use on boardroom tables or lecterns. Both microphones provide a bass-tilt switch, allowing the user to tailor the low-end response and reduce subsonic noise. The included RFI suppression ensures trouble-free operation even with active cell phones nearby. Audio-Technica’s ES947 low-profile cardioid condenser boundary microphone is recommended for unobtrusive table-, ceiling-, or panel-mount applications in high-quality sound reinforcement, professional recording and teleconferencing. Designed for permanent installation, the microphone is equipped with a self-contained power module with an XLRM-type output connector, eliminating the need for an external power module. Protected by a rugged all-metal case with a two-layer steel mesh grille, the microphone has a cardioid pattern for enhanced gain before feedback and improved signal-to-noise ratio. Revolabs Executive Elite 4- and 8-channel Wireless Microphone System, by adjusting audio settings, users can introduce 44 or more microphones in one area in the US, South America and Japan, and up to 76 microphones in Europe, Africa, Asia and Australia. Shure’s Microflex Microflex Advance Table Array is a networked array microphone targeted at AV Conferencing applications where premium audio and a low profile appearance are paramount. Shure’s IntelliMix DSP Suite Steerable Coverage technology deploys four discrete zones of table coverage for pristine audio capture, configuring all parameters seamlessly through a browser-based graphical user interface. Shure’s Microflex Advance Ceiling Array is a premium networked array microphone for AV Conferencing that captures impeccable audio from above the meeting space with Shure proprietary Steerable Coverage technology and an intuitive user interface that allows for simple configuration of presets, templates and polar patterns. InFocus has expanded beyond its own displays to offer ConX, a cloud-based group video conferencing service. 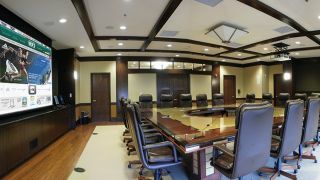 Full HD, meeting rooms can connect up to 25 participants. ConX Video Meeting participants dial in from their SIP or H.323 video calling system, Windows or OSX computer, iOS or Android mobile devices, Microsoft Lync or other apps such as Jabber. ConX joins all the participants together, face-to-face, and enables data sharing. AMX by HARMAN’s Enzo is a content sharing platform built specifically for meeting rooms, and other collaboration spaces providing instant access to a wide variety of content. Features include: Wirelses laptop screen mirroring using MirrorOp enables users to present content from Windows or Mac OSX laptop; Share local content from mobile devices; Moderator controls what content is going on the screen, with the ability to select up to 4 devices for display at once. Combine Enzo with the Sereno web conferencing camera for online web conferencing solutions to provide excellent video quality. Barco has expanded its ClickShare wireless presentation and collaboration portfolio to include the CSE-200 which has been developed for enterprise rollouts that require enhanced security features, a wider range of connectivity options (including AirPlay support), or central management. This unit can be integrated into the company’s network to enable remote management. Two users can share onscreen at the same time—via ClickShare Buttons or the ClickShare App, or a combination of the two. For user convenience, the CSE-200’s security features can be set to one of three predefined levels, depending on the company’s policies and needs. Crestron’s AirMedia allows users and wirelessly present PowerPoint, Excel, and Word documents, PDFs, photos, and screen shots from your personal iOS or Android mobile device on the room display. Mac and Windows notebooks also connect seamlessly, making presentations and collaboration from almost any device incredibly fast and easy. Up to 32 people can connect to AirMedia at the same time in the same room. Remote View enables up to 40 participants either at the back of the room or in other locations to log in from a web browser to view the presentation on their mobile devices. In Quad View mode, up to four presenters' content can be displayed simultaneously, making true collaboration possible. Kramer’s recently expanded of its line of products to include the award winning VIA line of wireless presentation and collaboration solutions and award winning K-Touch cloud-based control system, we have reached the point where we can offer complete end-to-end solutions for all the different types of meeting rooms and spaces and Kramer@Work is manifestation of that. While these are complete solutions, they are the foundations for these types of rooms and it is very easy to expand them with other “a la carte” items from extensive product line. Because of the wide variety of hearing aids on the market, and the significant variations in hearing ability within the hearing challenged community, it is important to determine what the requirements of the likely audience (participants) is and where they will be located. For example bright sunlight can often interfere with infrared systems; while induction loop systems may require physical construction not feasible in a particular location. The following four companies offer a full palette of hardware and system options for assistive listening installations. They also provide technical guidance, informational resources and support. All offer fully ADA compliant products.